The new nail art for this Saturday is up. I hope that you will like it. 1. Remove the previous paint by cleaning the nail paint with thinner/ nail paint remover/ acetone. 3. Apply a thick layer of black nail paint. 5. Choose any one finger. Mostly we go for ring finger as seen in my nail art and with a help of a tooth pick, draw random not so neat dots with white nail paint. 6. On the other nails draw French nail art with the help of the same white nail paint. 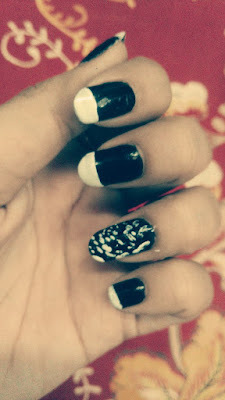 NOTE: Wait for black nail paint to dry completely. 7. After the art is done, let it dry. Then put a thick layer of transparent nail paint on your nails to safeguard your art. 8. Remove the paint on side skin with earbuds dipped in nail paint remover for final finishing. 9. Your nails are now more beautiful than ever! The nail art is simple to wear yet looks beautiful! What do you think? Nail paints acording to dress of your dress.